Whenever it’s time to exercise, I frequently have to open up a number of apps on my phone – one to track the workout and another to keep the tunes pumping. But a new running app from adidas is designed to roll those two experiences into one. Meet the new adidas go app, an app that helps choose the perfect Spotify songs to match the intensity of your workout. adidas go calculates your stride rate using your iPhone's built in accelerometer and uses that data to pick a song with an appropriately aggressive number of beats per minute. Songs can be pulled from your own Spotify playlist, or Spotify can pick tracks for you based on your preferred playlists, artists and genres. Think of adidas go as your own personal DJ that knows just when to blast out the music when you need to push through that final mile of your run. And if you hear a new song you like when running, you can easily favorite it and add it to your collection. 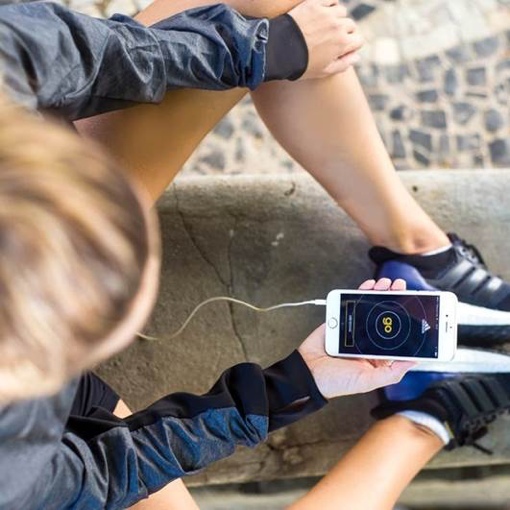 Of course, beyond the musical aspect, adidas go will measure and save the time, pace, distance and adidas miCoach Runscore of you daily workout. You share this information on social media (Facebook, Twitter, Instagram) if you’re fishing for a little bit of encouragement from your friends. All told, it's a nice alternative to expensive add-on exercise monitors like the coming Jawbone UP 4. Note that you'll need a subscription to Spotify Premium to make the most out of the app, though. The adidas Go app is currently available for iOS only via the Apple App Store. The app comes with a free 7-day trial of Spotify Premium so you can enjoy features like local music storage. After that, Spotify Premium costs $9.99 per month, with discounts are available for college students and multi-user families. If you don't have an iOS device, check out our tips for creating the perfect workout playlist. Did you try this app out? All the reviews on the store were pretty bad, but I downloaded it anyway. I got it connected to my Spotify premium fine and selected a couple playlists to link to, but when I started running, it played an intro piece, then just froze on a song. I tried a couple things, but ended up just going back to Spotify and MapMyRun+. I’m wondering if anyone else had better luck. Sorry to hear it didn’t work for you! I tried the app and it worked as advertised. When I first used it, though, I didn’t realize that you had to be moving during that test tone for it to calibrate to your pace.